The DEWALT DCS520T1 60V MAX 6-1/2" Cordless Track Saw features a zero clearance TrackSaw cutting system delivers precise, straight, splinter-free cuts. For use with TrackSaw dual-edged tracks for perfectly straight cuts in both directions. On-track cut depth: 2/1/8"(54mm) at 90; 1-5/8" (41mm) at 45. Brushless motor effortlessly powers through hardwoods up to 2/1/8" thick. The DEWALT DWC1KIT-B Combo Kit features a DWFP12231 18-guage Brad Nailer, and a DWFP55126 6 gallon Air Compressor. The Brad Nailer drives 18-gauge nails from 5/8-inch to 2-inch length. This nailer offers a long life, oil-free motor with a tool-free depth-of-drive adjustment with detents for proper setting of nail heads. The Air Compressor offers 2.6 SCFM delivered at 90 PSI pump, 6 gallon tank and 165 max PSI for long tool runtime and fast recovery. The durable oil-free pump provides long maintenance-free operation, and a low 75.5 dBA for a quiet work environment (Tested per ISO 3744). The low 10 amp draw motor starts easily in cold weather or with extension cord, and it has two regulated, factory installed air couplers to easily support two users. Includes heavy-duty handle, cord wrap and console cover to make unit easy to carry; only 30 lb for easy portability. Complete with a battery and charger, DeWalt's 20V Max Cordless Lithium-Ion 7.25-inch Sliding Compound Miter Saw delivers quick and accurate miter angles with the convenience of a portable, lightweight, and compact design. It features an integrated XPS Crosscut Positioning System, which provides a cut-line indication for increased accuracy and perfect alignment with every cut. The DEWALT 5-Tool Combo Kit (DCK520D2) is ideal for most cutting and fastening applications on the job site or at home. This combo kit features a drill driver, impact driver, reciprocating saw, circular saw, two batteries, a charger, carrying bag and work light. The DCK520D2 is backed by a DEWALT 3-year limited warranty for added peace of mind, so you can count on tools that are built to last. This 20V Cordless MAX Premium Hammer Drill Kit by DeWalt offers a three-speed all metal transmission that matches the tool to the task for the fastest application speed and improved runtime. The hammer drill also provides an LED light with 20-second delay after trigger release and an ergonomic handle for total comfort and control. 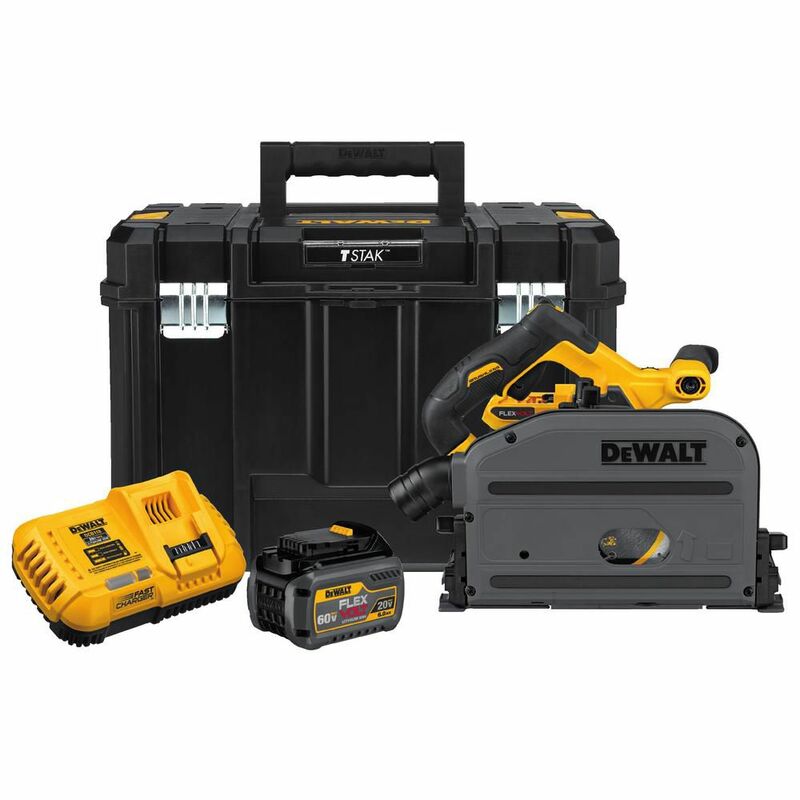 FLEXVOLT 60V MAX 6-1/2-inch Cordless Track Saw Kit The DEWALT DCS520T1 60V MAX 6-1/2" Cordless Track Saw features a zero clearance TrackSaw cutting system delivers precise, straight, splinter-free cuts. For use with TrackSaw dual-edged tracks for perfectly straight cuts in both directions. On-track cut depth: 2/1/8"(54mm) at 90; 1-5/8" (41mm) at 45. Brushless motor effortlessly powers through hardwoods up to 2/1/8" thick. FLEXVOLT 60V MAX 6-1/2-inch Cordless Track Saw Kit is rated 4.9 out of 5 by 8. Rated 5 out of 5 by Tgraddy88 from Would give it 6 stard I have used the festool and makita saws both measure the depth of cut in metric. Dewalts is in imperial measurement. But a straight factory edge every cut. Rated 4 out of 5 by Dave from Saw works well, but they need to come up with... Saw works well, but they need to come up with a more accurate way of measuring how to locate the track and figuring the width of the blade. I would suggest they come up with a measuring tool to locate the track. Dose this come with the track/tracks? And if not,do you sell the tracks and how much are they?